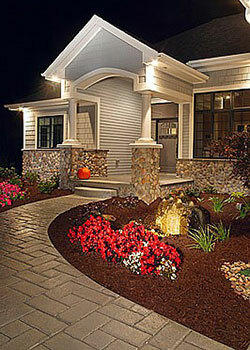 Our low voltage outdoor lighting adds safety and elegance to any landscape. Along with incandescent lighting, we offer high quality LED fixtures. LED lights are highly efficient, long lasting, low energy bulbs that are rated for about 40,000 hours of use. The low energy use of LED lighting helps prevent voltage drop allowing more fixtures with consistent brightness while saving you money on energy costs. We offer a wide variety of fixtures and colors from brands like Kichler and Vista Professional Lighting. Please see our links for ideas and examples of outdoor lighting.